31° 19' N., 30° 21' E.
At 9:00 A.M. in the village of El Nakhla el Baharia, located in the Nile Delta of Egypt, numerous stones having a combined weight of ~10 kg fell over an area of 4.5 km. Most of the friable stones, weighing from 20 g to 1,813 g, were completely or partially covered with a glossy-black fusion crust concealing a greenish-gray crystalline interior. The minimum pre-atmospheric diameter of the meteoroid was calculated to be 44 cm, and its low mass ablation is consistent with a very high entry angle close to verticle. Through extensive petrographic analyses involving samples of most of the eight known nakhlites, Corrigan et al. (2015) have demonstrated that a quantifiable measure of compositional heterogeneityabove that which can be attributed to differences in analytical methodsexists among different samples of the same nakhlite stone and among discrete meteorites of the nakhlite class. The phenocrysts composing the nakhlites have been described by some as originating as cumulus crystals that accumulated at the bottom of a pluton or shallow sill. However, Corrigan et al. (2015) determined that the petrographic evidence was more consistent with a scenario (see other proposed scenarios below) in which the olivine and pyroxene crystals had migrated from the initial magmatic cumulus zone, and were subsequently emplaced by means of a dynamically sorted, viscous crystal-liquid mush, possibly involving multiple injections, before final cooling. After the phenocrysts had been concentrated through this process, a portion of the host interstitial liquid might have drained away leaving the nakhlite lithology with similar characteristics to that of a compacted cumulate. Martian volcanic flow features consistent with this senario have been observed from orbit, such as at the Zumba crater site, and further recoveries of meteorite samples from the nakhlite pileperhaps a phenocryst-poor interstitial liquid componentcould provide further evidence which supports or contradicts this hypothesis. The mean modal composition of the Nakhla meteorite was shown by Corrigan et al. (2015) to be 80% high-Ca clinopyroxene (augite), 11% Fe-rich olivine, and 9% mesostasis. The mesostasis is a mixture of plagioclase, K-feldspar, Fe-Ti oxides, pyrrhotite ± chalcopyrite, pyrite, gypsum, and a reddish-brown aqueous alteration material consisting of a broad range of fine-grained hydrous minerals collectively called "iddingsite" or "Fe-Mg silicate". Various analyses of these Fe-Mg silicate veins over several decades has demonstrated that it consists of many different mineral phases including phyllosilicates, carbonates, sulfates, ferrihydrite, iron oxides, crystaline and amorphous silicates, and a halitesideriteanhydritechlorapatite assemblage derived from evaporite deposits. Analyses of the Fe-Mg silicate by Lee et al. (2015) showed that this ~633-m.y.-old component was composed primarily of nanometer-scale particles of opal-A (amorphous), similar in composition to terrestrial orange-colored fire opal, along with ferrihydrite. In addition, Lee and Chatzitheodoridis (2016) have identified the mineral berthierine, an Al- and Fe-rich serpentine, which replaces aluminosilicate glass in olivine-hosted melt inclusions. Berthierine, probably in association with the Fe-rich serpentine greenalite, was formed as liquid water of near neutral pH infiltrated the silicate through microfractures. A haliteclay assemblage was identified in Nakhla that was probably formed by percolating fluids within an interconnected matrix of cracks (Rost et al., 2005; Needham et al., 2011). The water-soluble ions of Cl, K, Na, S, C, Ca, and some others that are found within Nakhla match those that would be expected to precipitate through the low-temperature evaporation of an acidic brine. 3-D imaging of Nakhla has revealed a network of highly interconnected fluid pathways that pervade silicates and the mesostasis, which has resulted in a homogeneous distribution of secondary minerals including carbonates, sulfates, and halite. The sulfate and halite secondary minerals identified appear to have formed contemporaneously in later metasomatic episodes (Needham et al., 2013). Cartwright et al. (2013) analyzed several nakhlites, including Nakhla, for halogen abundances, and found a potential Cl-rich, trapped fluid component with Ar-isotopic ratios matching those of the martian atmosphere, likely reflecting shock-implanted atmospheric Ar. This component also incorporates other halogens with abundance ratios that are consistent with evaporation of surface brines, and may represent metasomatic fluid that circulated through the nakhlite cumulate pile. The finding of Cl-scapolite (marialite) in a melt inclusion in Nakhla is thought to reflect precipitation from a Cl-rich brine at temperatures of 700850°C at 1 bar during hydrothermal activity, or possibly from a Cl-rich magma during late-stage igneous activity (Filiberto et al., 2014). A scenario utilizing a different formation sequence was proposed by Lee et al. (2013, 2015). They argue that a shock deformation event occurred ~913 m.y. ago in the Nakhla lithology, which produced planar fractures and dislocations in silicate grains. These features permitted aqueous solutions which flowed ~280 m.y. later to infiltrate the near-surface rock, leading to the preferential etching and dissolution of olivine grains (compared to mesostasis and augite) over a short time periodspanning a few days to a few years. Secondary mineralization involving these dissolved cations occurred within the now enlarged pore spaces, crystallizing by replacement processes in the sequence Fe-Mg silicate (opal-A and ferrihydrite) ⇒ siderite carbonate ⇒ ferric (oxy)hydroxide. The initial acidic and oxidizing fluid is thought to have caused the etching of olivine, with the hydrous Fe-Mg silicate phase eventually filling the pore spaces. The Fe-Mg silicate formed in conditions of low temperature and a low water:rock ratio, and was initially manifest as an amorphous gel phase. This gel, located at the center of veins in the Nakhla meteorite, contains an average of 15 wt% water (Hicks et al., 2015). Ultimately, this amorphous silicate phase was transformed into nanocrystalline smectite following the loss of water through evaporation/desiccation processes. Thereafter, resumed infiltration of aqueous solutions into desiccation-induced fractures resulted in the formation of a second-generation mineral believed to be the phyllosilicate serpentine, which is sometimes intergrown with, and cross-cuts the original smectite veins (Tomkinson et al., 2015). The formation of gypsum occurred during the final stages of crystallization. These alteration assemblages were produced in the highest abundances at the bottom of the nakhlite pile as a result of impact-induced heating (100 m deep within a crater 110 km in size), melting of CO2-bearing permafrost, rapid progressive cooling, and oxidation. Thereafter, upward percolation of this pH neutral, ≤150 °C hydrothermal fluid through fractures, which lasted a short 110 months after the impact, led to fractionation of the secondary mineral assemblages (Changela and Bridges, 2011). This fractionation is revealed in the variation of Mg# and Fe+Si abundances of the gel phase within the sequence of nakhlites as the fluid migrated upward and eventually evaporated from the surface, forming soluble salts such as gypsum and halite. A few olivine grains show evidence of a fluid etching process that occurred over a brief time period measured in days to a few years, depending on the fluid pH and temperature. These faceted, µm-scale etch pits are filled with secondary minerals in the form of amorphous gel or nanocrystalline smectite, produced through chemical reactions sustained by the dissolution of the silicates (Tomkinson et al., 2011, 2013, 2015). In almost all nakhlites, secondary mineral assemblages have been identified that were the result of dissolution of olivine, and are present in such forms as siderite, clay-like phases, and an amorphous hydrated FeMgAl silicate gel. This gel was formed as a late brine product through the precipitation of a smectite-like material, identified as saponite by X-ray Absorption Spectroscopy (Hicks et al., 2012). 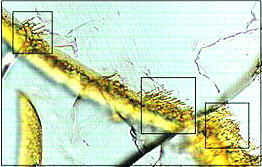 The gel is cross-cut by veins of Cl-rich alteration material produced by the injection of a cold saline fluid (Changela and Bridges, 2010; Tomkinson et al., 2011). The nakhlite Lafayette has an ArAr age for its mesostasis component that is 200300 m.y. younger than that for the whole rock, indicating that it was affected by an extended secondary thermal event (Korochantseva et al., 2010). Lafayette, which was situated near the bottom of the nakhlite cumulate pile, experienced the highest degree of hydrothermal alteration. It contains the typical amorphous gel along with three textural types of phyllosilicate, each composed primarily of smectite and serpentine (Changela and Bridges, 2010). The formation age of the phyllosilicate component has been measured at ~600 m.y., while other components give an age of >1,000 m.y. (Charlier et al., 2011). 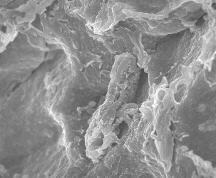 Carbonaceous material has been found by Thomas-Keprta et al. (2015) associated with Ba-rich halite crystals within secondary iddingsite veins. This first identification of the occurrence of organic matter in Nakhla was compared to terrestrial evaporites containing borates, minerals thought to have been integral to the synthesis of key components of RNA that lead to biological evolution. During analyses of a freshly exposed Nakhla sample associated with aqueous fluids in a regolith setting, Clemett et al. (2016) identified an ~ 20 × 20 µm carbonaceous feature (see BSE image below). Utilizing multiple analytical techniques, they determined that this organic matter represents an indigenous aromatic carbon compound associated with a low-temperature aqueous alteration phase, with significance to the potential for biogenesis on Mars. Interestingly, Mncarbonates were also precipitated during brine evaporation, a process which on Earth, and perhaps on Mars, is microbially mediated (Bailey et al., 2003). A new weathering product was recently discovered within olivine melt inclusions in Nakhla (Rost et al., 2003). It is a brown microcrystalline phase, thought to be associated with precursor amphibole. Water contained within hydrous minerals in Nakhla accounts for 0.110.13 wt% (Lee et al., 2014 and references therein). Based on these findings, it is a reasonable assumption that Nakhla resided in a locale such as a crater that enclosed a hydrothermal liquid formed by impact-induced melting of subsurface ice. In addition to Nakhla, nine other nakhlites have been discovered and classifiedLafayette, Governador Valadares, NWA 817, Y-000593/749/802, NWA 998, MIL 03346/090030/090032/090136, NWA 5790/6148, NWA 10153, and Caleta el Cobre 022. Most of these nakhlites have undergone detailed analyses that indicate all share similar mineralogies and petrologies, as well as crystallization and cosmic-ray exposure ages of ~1.4 b.y. and ~10.5 m.y., respectively (Misawa et al., 2003; Park et al., 2008). Correction of the ArAr crystallization age of Nakhla and NWA 998 was accomplished by Cartwright et al. (2010) by accounting for a trapped component of 40Ar. The resulting ages are consistent with the ages determined from other chronometers. In addition, aqueous alteration products from Y-000593 and Lafayette have similar RbSr ages of ~650 m.y. These age correlations support the inferrence that all of the nakhlites are source-crater paired. ArAr systematics for Nakhla indicate that a localized shock event occurred 913 (± 9.0) m.y. ago (Cassata et al., 2010). Evidence for such a localized shock event is found in the extensively fractured pyroxene along with shock-melt veins consistent with pressures of 2040 GPa, and at the same time, shock features in plagioclase that are consistent with pressures of 1520 GPa. The shock-induced transformation of tridymite and/or cristobalite into coesite has been identified in Nakhla by Mikouchi et al. (2018). Models constructed for the time period following this shock event show temperatures for the Nakhla rock as either ~120°C for 10 m.y. with it residing under an ejecta blanket, or ~355°C for several days for it residing near the surface. Temperatures following the ejection from Mars ~9 m.y. ago were ~110°C or ~330°C, corresponding to a duration of 10 m.y. and several days, respectively. Despite their similarities, some important compositional differences do exist among the nakhlites. For example, a pre-terrestrial, reddish alteration product present in NWA 817 has been identified as a water-bearing ferromagnesian phyllosilicate of the smectite group, different from the iddingsite-like alteration phase present in Nakhla (Gillet et al., 2002). Multiple lines of evidence suggest that this smectite-like alteration product formed by the percolation of a sequestered, mantle-derived, aqueous fluid through crustal rock. 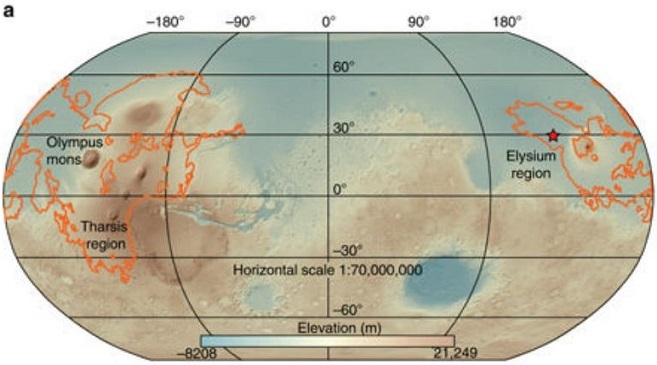 This hypothesis is supported by the unfractionated H-isotope value (very low D/H ratio) of the alteration phase, which suggests that the alteration fluid had not been equilibrated with the martian atmosphere, in contrast to the water from other nakhlites. The enrichment of Fe and LREE in the alteration phase of NWA 817 is attributed to the infiltration of the alteration fluid through the local pre-existing rock structure, incorporating a dissolved plagioclase component. Notably, the NWA 5790/6148 nakhlite contains the highest Th, U and REE concentrations reported thus far in the group, exhibiting a strong LREE enrichment. This suggests that minerals in NWA 5790/6148 were derived from a more evolved parent melt. Also of interest is the fact that the augite component in NWA 5790/6148 crystallized from a compositionally distinct melt source compared to that from which the olivine and mesostasis were derived (Sautter et al., 2002). The mesostasis in NWA 5790/6148 is present in the highest proportion (ave. 38 vol%), while the MIL pairing group (the most highly oxidized nakhlite, exhibiting the lowest degree of equilibration) and NWA 817, both previously considered to have formed near the top of the nakhlite pile, contain the next highest proportion of mesostasis (e.g., ~23 vol% in the MIL pairing group). Lesser mesostasis abundances are present in other nakhlites, representing a descending sequence from the top (e.g., ~915 vol% in Y-000593, Nakhla, Governador Valadares, and Lafayette). Northwest Africa 817 contains an Fe-rich feldspar component indicative of rapid crystallization following undercooling conditions. The MIL pairing group contains the lowest abundance of olivine, and has pyroxenes that are strongly zoned with hedenbergite. For many other features (e.g., highly zoned olivines [Fa5986 in NWA 817; Fa5691 in MIL], olivine alteration products, skeletal Ti-magnetite in the mesostasis, ave. modal pyroxene abundance, and low olivine abundance), NWA 817 and the MIL pairing group show very close similarities. Northwest Africa 5790/6148 appears to have many close similarities as well, consistent with rapid cooling near the top of the nakhlite pile (or outer margin of a lava flow), although some important differences have been identified. Sulfide phases present in the mesostasis component of nakhlites consist primarily of pyrrhotite (±chalcopyrite) and rare pentlandite. 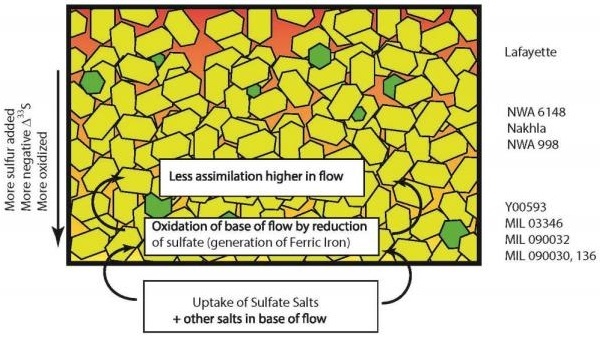 These sulfides are thought to have precipitated from the parent melt under reducing conditions, which concomitantly yielded a high abundance of Fe+3-enriched, skeletal titanomagnetite grains reflecting an overall oxidative chemistry (Chevrier et al., 2011; Franz et al., 2014; Dottin et al., 2018). 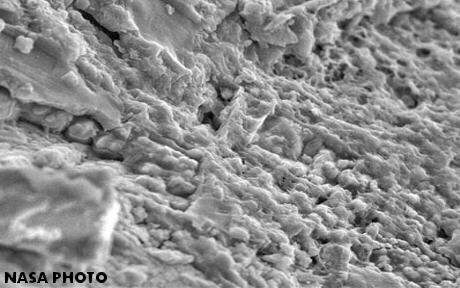 It is argued that the parental magma assimilated a component of sulfate-bearing crustal regolith and/or hydrothermal fluid during the late magmatic stage under low-temperature conditions. In addition, it is presumed that sulfate sulfur was concentrated at the bottom (or interior) of the lava flow where the cooling rate was the slowest. Reduction processes resulted in sulfide abundances of 530 (±160) ppm in NWA 998 located at the bottom, 210 (±70) ppm in Nakhla located near the middle, and 80 (±25) ppm in NWA 817 located at the top (Chevrier et al., 2011). Similarly, the sulfide grain size varies with the crystallization location within the conjectured shallow sill or thick lava flow. Dottin et al. (2018) posited that photochemical fractionation and degassing of sulfur occurred near the surface, which led to differences in the Δ33S in nakhlites corresponding to their position within the cumulate pile or lava flow(s). Accordingly, the negative Δ33S value, positive δ34S value, and high titanomagnetite abundance of the MIL nakhlites attest to their origin at the base of a lava flow where assimilation of sulfate salts from the soil below would be more favorable (see schematic diagram below). It is notable that the MIL nakhlites contain melt inclusions within clinopyroxene with a trapped chlorine-rich fluid along with its reaction product, potassic-chlorohastingsite (McCubbin et al., 2009). Successive oxidation of this fluid and its reaction with pyrrhotite led to acidification and subsequent formation of jarosite and hematite upon cooling below ~200°C. Unlike Nakhla, the MIL pairing group did not experience significant shock disturbance since its crystallization. Fracture-free (type Ia) melt inclusions trapped within augite cores could record the Nakhla primary magma composition (Sautter et al., 2012). Mineralogical analyses of NWA 998 indicate that it is an unusual, orthopyroxene-bearing nakhlite, which was permeated by deuterium-rich fluids on Mars. One of the most recent nakhlites to be recovered, NWA 10153 and pairings, shows a similar petrology to NWA 998 and likely also originated near the bottom of the nakhlite pile (Irving et al., 2015). The three paired nakhlites from Antarctica, Y-000593/749/802, have a combined weight of ~15 kg, which constitutes the largest nakhlite found to date. The composition of the mesostasis in the Y-000593 pairing group suggests a faster cooling rate than that of Nakhla, Governador Valadares, and Lafayette, but slightly slower than that of NWA 817. To account for the difference in trace element ratios that is observed between the chassignites and the nakhlites, McCubbin et al. (2013) suggested that an exogenous Cl-rich, LREE-enriched fluid was introduced during initial crystallization and accumulation of olivine and chromite, as sampled by the chassignites, and prior to crystallization of clinopyroxene and olivine (±orthopyroxene), as sampled by the nakhlites. Subsequent draining/degassing of this Cl-rich fluid from the accumulating nakhlite pile was accompanied by preferential removal of Fe+2 over Fe+3 from the residual magma, which concurrently increased the oxidation of the system. McCubbin et al. (2013) also reasoned that such an infiltration of metasomatic fluid into the chassignitenakhlite cumulate pile would produce an olivinepigeonite layer between the chassignite and nakhlite horizons, although such a lithology is not yet represented in our meteorite collections. Interestingly however, Krzesińska et al. (2017) have identified cumulate pigeonite grains in two small pyroxene-bearing fragments in Chassigny which they infer were derived from this hypothesized olivinepigeonite layer prior to its final crystallization. Moreover, they found unique µm-scale aggregates associated with these pyroxene-bearing fragments that consist primarily of sulfide phases incorporating µm-sized metallic grains of Pb, Hg, Ag, Au, and Sn. It is considered likely that these metal grains were introduced to the cumulate pile through the Cl-rich metasomatic fluid. A study that proposes a different stratigraphic ordering of the nakhlites was published by Grady et al. (2007). They argued that although the MIL pairing group contains the least equilibrated olivine cores and has experienced the most rapid cooling of all the known nakhlites (without regard to the later recovery of NWA 5790/6148)both factors which are consistent with a shallow emplacementit also contains the lowest abundance of carbonates and has an intermediate 13C isotopic composition; these factors are more consistent with minimal aqueous alteration at greater depth. Therefore, they reason that the MIL pairing group formed at the lowest zone of the flow and experienced cooling by circulating groundwater derived from melted ices. The source of the isotopically-light carbonates is considered to be related to this groundwater. Mikouchi et al. (2012) conducted a cooling rate study of the nakhlites utilizing FeMg and Ca zoning of olivine along with secondary mineralogy. Although the exact burial depths for NWA 5790/6148, MIL 03346 and pairings, and NWA 817 could not be resolved, they calculated that these three were all emplaced within 2 m of the surface. Notably, NWA 5790/6148 exhibits some important differences compared to the other nakhlites. It exhibits sector-like zoning in Al, Ti, and Cr within augite that is more similar to that in Nakhla and Y-000593/749/802 rather than NWA 817 and the MIL pairing group. Based on these mineralogical characteristics, they reasoned that NWA 5790/6148 was derived from a more evolved portion of a common flow, or possibly even from a separate flow. In their investigation of diffusion-generated Li zoning in augite grains from the nakhlites MIL 03346 and NWA 817, as well as FeMg zoning in olivine grains from NWA 817, Richter et al. (2016) calculated the cooling rates and determined the likely positions of these nakhlites within the cumulate pile. They also determined that the mineral zoning was developed after the augite and olivine had almost fully crystallized (~80%). Based on their revised parameters for initial diffusion temperature and oxygen fugacity (1050°C; QFM buffer), Richter et al. (2016) argue that crystal aggregates precursor to both of these nakhlites resided within a pluton for an extended time period of several years or more before undergoing rapid cooling from 1050°C, probably within an extruded lava flow. They calculated that during the rapid cooling stage, MIL 03346 cooled faster than NWA 817at a rate of ~1°C/hr compared to 0.2°C/hr, respectively. 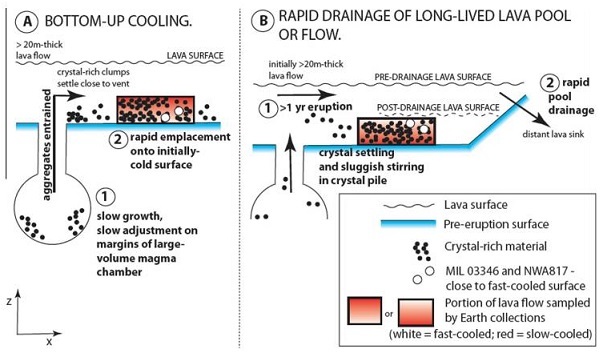 However, it remains unresolved as to whether the two nakhlites were rapidly cooled near the cold base of a thick lava flow, or close to the surface of such a flow following drainage of any overlying melt; these two scenarios are illustrated in the diagram below. They estimated that in the former scenario, MIL 03346 would have been located ~75 cm above the base, while NWA 817 would have been ~200 cm above the base. In the latter scenario, the thickness of the lava flow is not a constraint on the ultimate cooling rate of the nakhlites as long as any overlying melt is quickly drained away. Utilizing advanced investigative and modeling techniques to study the thermal history of MIL 03346, Domeneghettia et al. (2013) calculated the closure temperature for augite crystals to be 500 (±100) °C. This temperature corresponds to a relatively slow cooling rate at a depth of 85 m. However, these new calculations are contrary to the generally accepted theory that MIL 03346 cooled rapidly <2 m (or 4 m; Mikouchi et al., 2014) from the top of the nakhlite cumulate pile. Accordingly, the team proposed a scenario that would be consistent with the thermal history they established for this nakhlite: MIL 03346 initially cooled to ~500°C at or near the surface, at which point it became insulated by a subsequent eruption of lava. This later blanketing flow could be represented by the nakhlites NWA 817 and NWA 5790/6148. Research indicates that these meteorites derive from the top of the nakhlite pile (or near the margins of a thick lava flow), based in part on their quenched textures and highly-oxidized state (Agee et al., 2014). 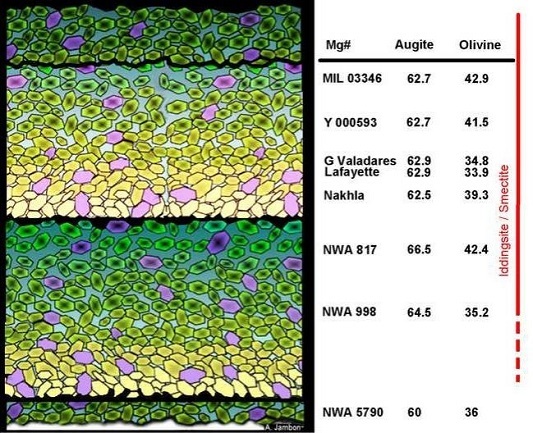 In a contrasting view, Lentz et al (2005) found a lack of correlation between the olivine texture/distribution and the stratigraphic order, and propose that the olivine texture/distribution is instead related to formation in different lava flows of variable composition. Excluding the later found nakhlites, they suggested that at least two flows generated the various nakhlitesone which produced NWA 817, Nakhla, and Governador Valadares, and another which produced Y-000593/749/802, Lafayette, and NWA 998. A third flow may have generated the MIL pairing group. To account for the postulated gabbroic layer, which should have overlain the nakhlite unit and slowed its rapid cooling rate, they proposed that these rapidly cooled nakhlites were extruded later in evolved lava flows, but before plagioclase formation began. Augite crystallized from an evolved mantle melt and accumulated at the bottom of a sub-surface magma chamber. Multiple melt batches involving variable degrees of fractionation produced the compositional variation observed among the nakhlites. Subsequently these augite cumulus crystals (glomerocrysts) were disrupted and entrained by a more evolved magma flow. As a consequence the augites sustained crystal damage and partial resorption. This ascending magma erupted to the surface where lower pressures promoted crystallization of olivine, incorporating the augite cores as xenocrysts. Growth of olivine continued for a time followed by a final overgrowth of augite, all of which halted when the melt drained away and a rapid cooling stage ensued. In their scenario, Jambon et al. envision NWA 5790/6148 at the top of the earliest lava flow where the rock experienced very rapid cooling, thereby limiting compaction (reflected in the lowest degree of preferred orientation of augite crystals among nakhlites) and equilibration through diffusion, and enabling the retention of a relatively large volume of mesostasis. They argue that the final position of NWA 5790/6148 was at the bottom of a stratified cumulate pile, a location which prevented the occurrence of secondary low-temperature hydrous alteration consistent with the absence of "iddingsite" in this nakhlite. In their diagram of the nakhlite cumulate pile, NWA 998 and NWA 817 are located within the intermediate flow zone based on several features they have in common; e.g., they have similar augite core compositions which are distinct from all other nakhlites, they have high incompatible element abundances (similar also to NWA 5790/6148), and they have similar magnetite abundances. The top flow contains those nakhlites with similar augite core compositions as well as those with a high abundance of secondary aqueous alteration minerals; Nakhla is considered to reside near the bottom of this stratum. Balta et al. (2016) conducted a geochemical and petrographic study of NWA 5790 which included major, minor, and trace element analyses along with crystal size distribution (CSD) and spatial distribution pattern analyses. Based on this study, a new scenario was presented to explain the formation history of the known nakhlites (excluding the most recently discovered nakhlite NWA 10153 and pairings) and to further characterize the stratigraphic relationship that existed among them, with an emphasis on the three nakhlites generally considered to have crystallized nearest the top of the cumulate pile or lava flow(s)NWA 5790/6148, MIL 03346 and pairings, and NWA 817. Although previous studies have concluded that NWA 5790/6148 likely formed above MIL 03346 in a common lava flow, Balta et al. (2016) noted that the mesostasis in NWA 5790 and NWA 817 contains a significant abundance of crystalline phases compared to that in MIL 03346; this is consistent with NWA 5790 and NWA 817 cooling more slowly at a deeper location than MIL 03346. Another inconsistency with the location of NWA 5790/6148 at the top of a common cumulate pile or lava flow was demonstrated through their REE analyses. The measured REE abundances in augite rims are higher in MIL 03346 and NWA 817 compared to NWA 5790, which would correspond to a higher degree of fractionation and a higher position in the cumulate pile or lava flow for MIL 03346 and NWA 817. Furthermore, based on both its CSD pattern and small olivine diffusion rims, MIL 03346 appears to have experienced a higher cooling rate nearer the top as compared to NWA 5790. In addition, major and minor element chemistry and petrographic characteristics tend to link NWA 5790 with NWA 817 and distinguish both of them from MIL 03346, making the hypothesis of a single verticle stratigraphic sequence untenable. In consideration of these and other findings (e.g., a sizable "iddingsite" alteration pocket in NWA 5790), Balta et al. (2016) have proposed that these three nakhlites represent separate breakout lobes from a common parental lava flow (see schematic diagram below). After a precise accounting and correction for the trapped (from martian atmosphere), radiogenic (from in situ 40K), and cosmogenic (from cosmic-ray exposure; weighted mean age = 10.7 [±0.8] m.y.) Ar components in six nakhlites (Lafayette, Y-000593, Y-000749, NWA 5790, Nakhla, and MIL 03346), Cohen et al. (2017) calculated a high-resolution 40Ar/39Ar age for each different nakhlite; they consider that these ages reflect the timing of the respective source lava eruption. The data show that these nakhlites erupted over a timespan of 93 (±12) m.y.between 1.416 (±0.007) and 1.322 (±0.010) b.y. ago. They suggest that these six nakhlites represent at least four distinct sequential lava flows from a single plume-fed volcano, and that the flows were stratigraphically ordered commensurate with the nakhlite Ar chronometry data (see diagram below). Importantly, because of the incongruent eruption ages of the two Yamato nakhlitesa separation of 70 (±10) m.y.it can be inferred that their source lithologies on Mars were located far apart, and therefore it is improbable that they are fall-paired. Analyses of the most recent nakhlite find, NWA 10153 and pairings, has been published by investigators including Mikouchi et al. (2016, 2017). They report that this nakhlite contains ~2530% interstitial mesostasis similar to the abundances in NWA 817 and MIL 03346 which are considered to have cooled rapidly near the top of the cumulate pile. However, the coarse nature of the feldspar in NWA 10153 (0.20.3 mm laths) is similar to that in NWA 998 (0.5 mm laths) which is considered to have cooled slowly near the bottom of the pile. Augite core compositions in NWA 10153 are similar to those of all other nakhlites, consistent with their crystallization from a common parental melt. This nakhlite exhibits complex chemical zoning in olivine and augitethe augite zoning is unlike that in any other nakhlite. Based on the Ca-Fe-Mg zoning profile, the cooling rate was determined to be 0.010.05 °C/hr; this is similar to that for Nakhla, GV, and Y-000593, which are considered to have crystallized at an intermediate depth within the pile. While Nakhla and other nakhlites from intermediate depths contain carbonates and halides, these are absent in NWA 10153. Low-temperature secondary aqueous alteration products (silicate gel phase) have been observed in both mesostasis and olivine fractures, a mineralogy common to the nakhlites near the top of the pile (Hicks et al., 2016). Another unique feature of this nakhlite is its significantly higher initial Nd-isotopic values and lower initial Hf-isotopic values compared to other nakhlites (Righter et al., 2016). Because of the ambiguous nature of NWA 10153, its position within a specific stratum in the nakhlite cumulate pile or lava flow(s) has not yet been determined; however, the combined data suggest a separate flow or lobe. A crystal size distribution analysis of nakhlites conducted by Udry and Day (2018) also shows that the NWA 10153 pairing group differs from other nakhlites; pyroxene is texturally much coarser and plagioclase is more abundant, and therefore a separate source lava flow or sill is indicated. 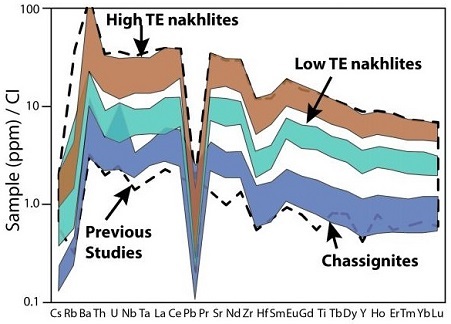 In addition, a trace-element analysis conducted by Udry and Day (2018) demonstrates a division of nakhlites into two distinct groupshigh trace-element abundance and low trace-element abundance (see diagram below). Importantly, Mikouchi et al. (2016) found that significant ambiguities also exist among the three known chassignites. Although each chassignite exhibits a similar cooling rate (0.0030.1°C/hr), olivine compositions between them show large variations: NWA 8694 is Fa46, Chassigny is Fa31, and NWA 2737 is Fa21. Moreover, each chassignite exhibits a distinct shock history. Therefore, they suggest that each of the chassignites is more likely associated with a separate flow or lobe (possibly within a common extensive igneous unit) rather than a single sequential accumulation (see above schematic diagram as proposed by Balta et al. illustrating separate lobes). the petrogenesis of Nakhla began with the formation of pyroxene-rich cumulates during an early Mars differentiation episode ~4.56 b.y. ago. a late magmatic event ~1.4 b.y. ago resulted in the partial melting of the cumulate mantle. an Fe-poor pyroxene crystal mush was intruded by Fe-rich olivine phenocrysts or xenocrysts (Sautter et al., 2012); rapid cooling prevented the exsolution of Ca-poor pyroxene. intercumulus melt inclusions were entrapped within olivine and augite crystals; this basaltic melt was rich in Fe and Ca, poor in Al and Ti, enriched in K relative to Na, and similar to alkaline basalts on Earth and martian rocks analyzed by the Spirit rover in Gusev crater. the rapid growth of augite and olivine was followed by a period of slow cooling, gravitational settling, and equilibration within a plutonic environment, forming a cumulus-textured solid. continued percolation of highly oxidizing, intercumulus magma resulted in late-magmatic re-equilibration. a final slow cooling phase resulted in the formation of exsolution features; this final solidification possibly occurred nearer to the surface, perhaps in a lava flow or sill. infiltration of liquid water produced iddingsite. accumulation of phenocrysts of the Fe-poor pyroxene augite occurred in a plutonic environment at depths commensurate with pressures of at least 3.0 GPa under high temperature, oxidizing, slow-cooling conditions. lesser amounts of olivine phenocrysts (~74% of these being of cumulate origin, the remainder having crystallized from the intercumulus melt) or xenocrysts, along with cumulate titanomagnetite micro-phenocrysts were formed. magmatic inclusions were trapped within both augite and olivine phenocryst cores; symplectites possibly formed at this time. entrainment and intrusion of the cumulate material to the surface produced a thick lava flow or sill. under rapid cooling conditions, plagioclase and other accessory minerals crystallized from intercumulus melt to form the mesostasis and the inner rims on augite phenocrysts. Ca-depleted pyroxene then nucleated within the mesostasis, and also formed the outer rim on augite phenocrysts. a late-stage, slow cooling phase set up the following formation sequence: 1) augitemagnetite aggregates, 2) symplectic intergrowths at olivineaugite boundaries, and 3) the formation of exsolution features in olivine cores. This scenario utilizes the 2.7 b.y. old, differentiated surface lava flow in Ontario, Canada, known as Theo's Flow, as an analog for the nakhlites. In particular, the differentiated, 60-m-thick pyroxenite layer is so similar to the nakhlites that it has been proposed they share the same formation processes. a very mafic magma flow or intrusion tens of meters thick began to pool. pyroxene nucleation began in a cooler zone underneath a quenched crustal layer and began to link into clusters. these pyroxene clusters sank through the low-viscosity magma only to be carried back up in convection currents. during the few days the pyroxene clusters were in this convective cycle, each cycle lasting for a few hours, they grew larger each time they reached the cooler nucleation zone. when the clusters became too heavy for convective forces, they settled out onto the cumulus pile below where the grains developed a preferred orientation. lastly, plagioclase crystallized from trapped low-Al melt, along with a possible unsampled gabbroic layer. Perhaps the most plausible scenario for the petrogenesis and comagmatic origin of both the chassignites and nakhlites has been put forth by McCubbin et al. (2013), and this scenario is consistent with a two-stage cooling history as proposed by Richter et al. (2015). This scenario is based in large part on advanced analytical techniques used to investigate the volatile-bearing minerals present in these two groups, as well as on new zoning and isotopic measurements to understand the thermal history of the nakhlite suite. a very mafic, depleted partial melt intruded into the near-surface crust to form a sill and underwent slow cooling (<50°C/year). olivine and chromite were the first cumulus minerals to crystallize within this chamber, composing the most slowly cooled, lowest stratigraphic horizon to become the dunitic chassignites. as cooling proceeded, an exogenous Cl-rich, LREE-enriched fluid infiltrated the chamber leaving the magma enriched in Cl and LREE, and depleted in water. the next horizon to crystallize is presumed to have a composition of olivine and pigeonite, but a representative sample has not yet been found. after the stratographic unit represented by NWA 998 was accumulated, the magma reached the point of Cl saturation; a low-density, Cl-rich fluid was exsolved/degassed and migrated upwards, initiating an eruptive phase. this escaping Cl-rich fluid removed proportionately more Fe+2 than Fe+3, thereby increasing the oxygen state in the later-crystallizing upper horizons. as clinopyroxene and olivine crystallization continued, and Lafayette, Governador Valadares, Nakhla, and the Yamato pairing group formed next in the sequence, the Cl-rich liquid became trapped as inclusions, subsequently forming apatite and amphibole. sequential crystallization occurred for the MIL pairing group, NWA 817, and NWA 5790/6148 at the upper horizons of the magma unit or at the base of a thick lava flow, undergoing rapid cooling. following crystallization of the cumulate pile and lava flow, alteration by low-temperature aqueous fluids produced secondary mineral phases such as iddingsite. Nakhla was subsequently ejected from Mars along with the other nakhlites and chassignites ~10.8 (±0.8) m.y. ago from a large crater. The two known olivine-rich chassignites, with their similar crystallization age of ~1.3 b.y. and similar cosmic ray exposure age of ~10.5 (±1.6) m.y., were likely ejected during this same impact event. The nakhlites were only weakly shocked during their ejection, and experienced estimated peak pressures of 1420 GPa, among the lowest of the martian suite. Fritz et al. (2005) revealed that a correlation exists between the Mars-to-Earth transfer time and the shock stage of the material; i.e., fragments having a higher degree of shock also have a faster transit to an Earth-crossing orbit and vice versa. Therefore, the absence in our collections of highly shocked nakhlites may be reconciled by consideration of their short lifetimes on Earth (less than ~1 m.y.). The high-resolution 40Ar/39Ar mid-Amazonian age determined for six nakhlites by Cohen et al. (2017) led them to the identification of a potential source crater (see image below). This 6.5 km-diameter crater is located at 130.799°E, 29.674°N in the Elysium region and was formed in a recent impact event. High-resolution satellite imagery shows a stratigraphic layering within the walls of the crater, and the calculated depth of ejecta which would have reached escape velocity, 4066 m, is consistent with the depth profile ascertained for the various nakhlites and chassignites. A legend has been perpetuated in the meteorite community since the Nakhla meteorite fall regarding the death of a dog that was hit by one of the falling stones, as interpreted from the following statement about the event first reported in the Arabic Newspaper "El Ahali": "One of them [fragments] fell on a dog at Denshal, leaving it like ashes in the moment." A current English interpretation of this statement can be made considering the literary style at the time of the fall in the early 20th century. A commonly used expression of that period, "of little moment", had the meaning of something inconsequential, while the similar expression "like ashes in the moment" can likewise mean something without consequence, i.e., unimportant. Therefore, the writer's statement can be interpreted to mean that a meteorite fragment fell on ("on" meaning in the vicinity of, as with a cannonball bombardment on a fort) a dog, which then [walking away indifferently] left it ("it" meaning the fallen stone, not the dog) without consequence, considering it to be of no importance. The image of a carefree dog oblivious to the imminent danger of falling rocks would have been notable. On a further note, the account given can be challenged based on several other salient points. The fall took place June 28, not on the 29th as stated in the report. Moreover, the reported village of Denshal is actually about 33 km southeast of the 5 km-long meteorite strewn field in El Nakhla el Baharia, an inordinately long distance away for a fragment from this meteorite of minimal pre-atmospheric size to have fallen. Denshal probably experienced sonic booms, but no other witnesses were reported to have observed a meteor or any meteorites from the Denshal area. 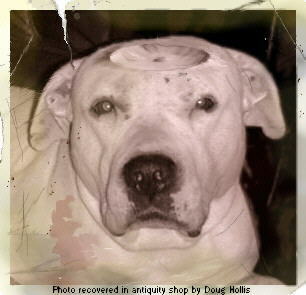 Then, too, the main evidence, a dead dog, was never produced. Lacking any compelling evidence to the contrary, it may be presumed that this story of a meteorite-killed dog is apocryphal, and can itself be laid to rest. The International Quarterly, Meteorite!, published a two-part article in 1998, vol. 4, nos. 2 and 3, in which Kevin Kichinka presents an exhaustive review of the record concerning many aspects of the Nakhla meteorite. By permission, his article is presented here in its entirety. The diameter of these particles, 0.22 µm, is within the size range of most terrestrial bacterial cells. 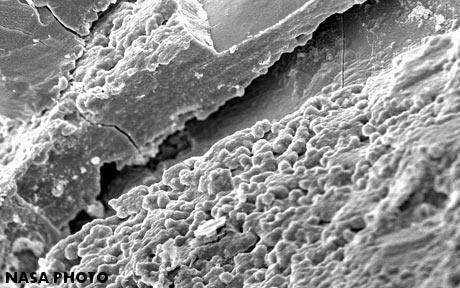 The cells have a complex surface structure at high magnification resembling that of some terrestrial mineralized bacterial cells. 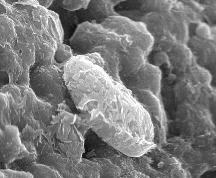 Microfossils consisting of coccoidal and rod-shaped forms similar to terrestrial bacteria. Some cells are joined in a manner similar to dividing bacteria, while one is observed to have a fibril-like appendage. 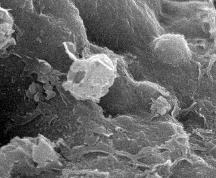 Material coating the surface of some cells resembles mineralized biofilm common to bacteria. The uneven distribution of these particles is consistent with that of other bacterial colonies. However, in another study (PNAS vol. 96, 1999), researchers suggest that the amino acids detected in Nakhla have a D/L ratio similar to that found in association with terrestrial bacterial activity, carrying a fingerprint matching that of Nile River Delta sediments. New samples of Nakhla constituting a depth profile were analyzed utilizing ToF-SIMS, SEM, EDX, and culturing techniques (Toporski et al., 2000; Toporski and Steele, 2004). They revealed a significant degree of microbial contamination in all samples studied, including the presence of spores and hyphae from several filamentous bacterial and fungal species. Identification of these various species using genetic techniques such as PCR amplification of DNA is ongoing. The implication of rapid terrestrial contamination may have repercussions for future Mars sampling missions. In a more recent analysis of a well-preserved Nakhla stone, a new optically dark carbon-rich component, lacking a terrestrial isotopic signature, was discovered filling fractures (Gibson et al., 2006; McKay et al., 2006). 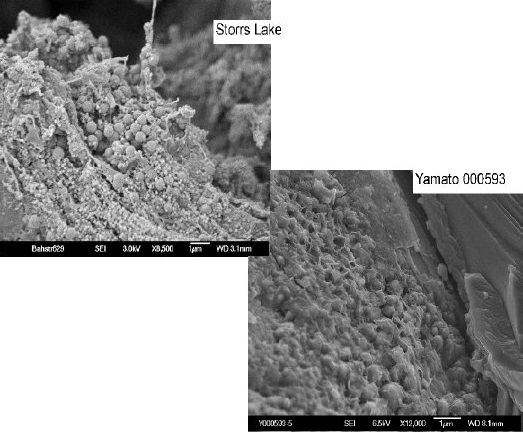 This carbonaceous component is associated with the low-temperature, secondary aqueous alteration product iddingsite, and it occurs in several forms (sub-µm- to µm-sized) including vein fillings, dendritic tubes connected to veins or intermingled with the host silicate within cavities, as tiny blebs, and interspersed among halite and gypsum crystals. An isotopic analysis has been conducted on this reduced, C-bearing phase, and the composition was identified as 13C from an extraterrestrial source. 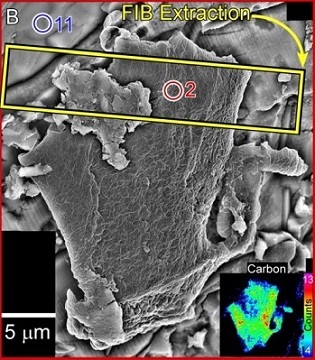 One µm-sized carbonaceous structure was found that is not related to graphite or carbonate, but is similar to kerogen (McKay et al., 2011). This is an organic structure associated with both halite and the iddingsite matrix. Further studies of Nakhla (McKay et al., 2011) revealed both an acid-labile organic component and a macromolecular, acid-insoluble organic component, the latter consisting of aromatic and alkyl-aromatic groups with ether linkages. The meteorite is still under study to distinguish the source of these organic phases from among the likely candidatesdelivery through impact of a carbonaceous impactor, or as a product of biogenic activity. 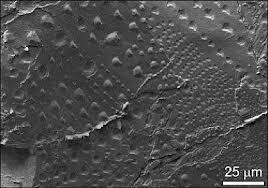 It is proposed that some of the mineral corrosion that is observed is the result of microbe-produced organic acids. Furthermore, McKay et al. (2010) have identified carbonates and what appears to be indigenous biomorphs embedded and intergrown with iddingsite in closely studied nakhlites. Nakhla biomorph embedded in a substrate of iddingsite, both of which formed at the same time on Mars. Interpreted by the authors as a relict martian microbe. Biomorphs from Nakhla, Y-000593, and Columbia River Basalt, consisting of coccoidal forms embedded in iddingsite. In a related study of a well preserved Nakhla specimen, conducted at Oregon State University (Fisk et al., 2006), tunnels measuring ~10 µm long were discovered, comparable to tracks formed within terrestrial igneous rocks and basaltic glasses from extreme environments by ~1 µm-sized iron-trophic bacteria. They also found elemental associations similar to some terrestrial microfossils. 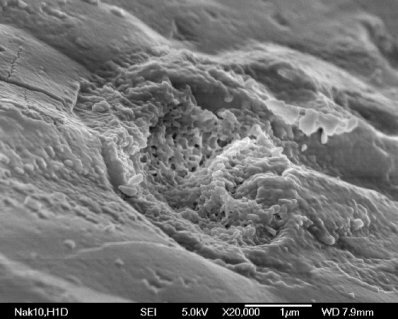 Their findings have raised the possibility that martian bacteria were extant 600 m.y. ago during a period when Nakhla was exposed to an aqueous environment. Tunnels are resolved within fractures in a Nakhla sample (in boxes). An intriguing reddish-orange-colored ovoid structure has been identified in a Nakhla thin section investigated by Chatzitheodoridis et al. (2013, 2014). The ovoid is situated within mesostasis material between two pyroxene crystals, and it is made obvious through advanced imaging techniques that the structure originated on Mars. The ovoid consists of a concentrically zoned wall consisting of a crystalline, Fe-rich saponite clay, enclosing a hollow volume containing two "island" features. Although it was initially seen to resemble a biomorphic structure, an in-depth investigation has now determined that the ovoid was most likely formed through abiotic processes; e.g., partial space-filling of a vesicle. For an explanation of the image components see the LPSC abstract. Other evidence for possible indigenous martian biogenic activity has been presented by White et al. (2014). 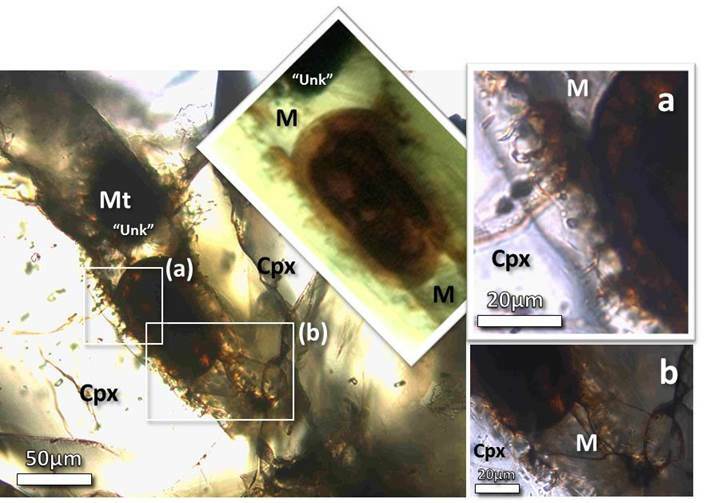 They have analyzed two distinctive carbon-rich features in the nakhlite Y-000593 associated with the orange-yellow-colored, complex secondary alteration phase iddingsitea hydrous alteration mineral assemblege common in the nakhlite suite. One such feature has been described by the investigators as curved, sigmoidal-shaped, threadlike microtunnels that penetrate into adjacent olivine, consistent with bioerosion textures known to exist in terrestrial basaltic glass (see image A below). 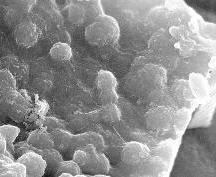 The other feature, similar in size and shape to certain terrestrial fossilized microbes, have been described in this meteorite as sub-µm-sized, close-packed organic spherules embedded between layers of iddingsite (see image B below). A martian biogenic origin for these carbonaceous (kerogen-like) features in the nakhlites is under investigation. 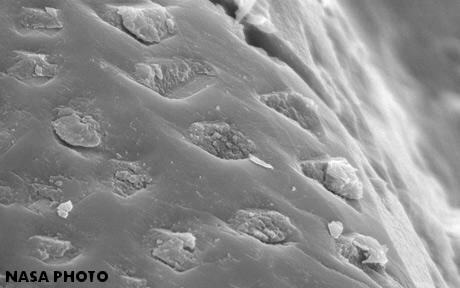 The first identification of N-rich organic matter indigenous to Mars was made by Thomas-Keprta et al. (2017, #2725) in a fresh Nakhla sample previously preserved at the BMNH. This finding supports the potentiality of a biological presence of Mars. The nakhlite group presently comprises Nakhla, Lafayette, Governador Valadares, NWA 817, Y-000593/749/802, NWA 998, MIL 03346 and pairings, NWA 5790/6148, and NWA 10153. Although ALH 84001 is an orthopyroxenite, and as such was characterized by the Planetary Chemistry Laboratory at Washington University as a subgroup of the nakhlites, its parental source magma has a composition that is consistent with the same mixtures of depleted and enriched REE end-member components that are used in a geochemical classification of the shergottites (Lapen et al., 2012). It was determined that the source magma of ALH 84001 contained a higher proportion of the enriched REE component than all other shergottites studied thus far. Therefore, ALH 84001 may be most appropriately classified as a subgroup of the shergottites. Based on data from the Infrared Mineralogical Mapping Spectrometer aboard the Mars Express orbiter, olivine-enriched craters in the region of Thaumasia Planum were found to be the best match to the nakhlites (Ody et al., 2013). The specimen of Nakhla pictured at the top of this page is a 1.9 g fragment containing a patch of reddish-brown material (seen in the upper center of the image), probably an aqueous alteration product similar to iddingsite or smectite (and martian microbes? ).